SYDNEY, AUSTRALIA—Compact Monitor Systems recently installed a complete networked audio system by HARMAN Professional Solutions at Fitness First Barangaroo. With more than 360 locations worldwide, Fitness First is the largest privately owned health club in the world. 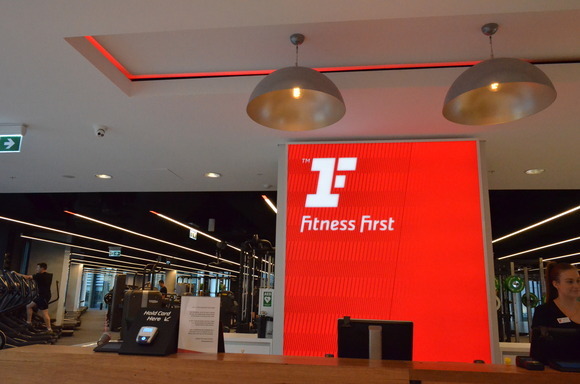 Fitness First opened Australia’s first “connected gym” in 2017 as part of the renowned Barangaroo urban renewal project. Located in Tower One, the largest office tower in Australia, Fitness First Barangaroo provides a holistic exercise experience with the latest innovations in technology to its members. Covering an area of almost 13,000 square feet, its facilities consist of a weightlifting gym, freestyle gym and group fitness studio. In order to deliver inspiring audio content with exceptional clarity to its members in multiple zones throughout the entire facility, Fitness First hired Compact Monitor Systems to install a complete networked audio system by HARMAN Professional Solutions. To provide Fitness First Barangaroo’s members with a clear and unobtrusive audio experience, Compact Monitor Systems’ Bill Richardson designed and integrated a multi-zone audio system into the fitness center’s architectural features. The networked HARMAN system installed by Compact Monitor Systems consists of JBL Professional speakers, Crown amplifiers and BSS processors. JBL Contractor Control Series loudspeakers offer integrators a complete range of solutions for any form factor or requirement. JBL Control 67 P/T full-range speakers and Control 60 subwoofers are suspended above the light fixtures in the three main gyms, providing balanced audio coverage across the large spaces. JBL Control 24C compact in-ceiling loudspeakers deliver full quality sound to the reception area, bathrooms and hallways. The multi-zone system is powered by Crown CDi Series amplifiers and networked via BSS Soundweb London BLU signal processors, enabling intuitive volume control and source selection in each zone.